Summary: A very enjoyable and well-made film. Liverpool, 1955, where a teenage boy called John (Johnson) is being raised by his aunt Mimi (Scott Thomas) and uncle George (David Threfall). Mimi is loving in a terribly English, aspirational and repressed sort of way; George is a bit more of a companion for the lively, intelligent boy. So when George dies of a heart attack, John is devastated (Mimi’s response to his tears: ‘Don’t be silly’). At George’s funeral John notices a red-haired woman in a dark coat; his cousin Stan offers to show him where his mother lives. John agrees; shocked to discover that her house is less than a mile from his aunt’s, he is also delighted to meet Julia (Duff). Where Mimi is strict and demanding, Julia is fluffy and fun. Her bright hair matches her clothes and she overflows with love and affection for John. Their relationship is like a secret love affair, thrilling clandestine meetings between two lovers, with Mimi the neglected wife sitting at home chain smoking. Julia introduces John to rock and roll and, crucially, teaches him to play the banjo. Mimi, unaware, buys him his first guitar and John puts a band together; when his marks at school fail to improve and he is suspended, he announces he’s moving in with Julia. Bobby (Morrissey) is less than welcoming and later that night John overhears a tense conversation between Julia and Bobby; he realises that she is more fragile than he looks and moves back to Mimi’s the next day. 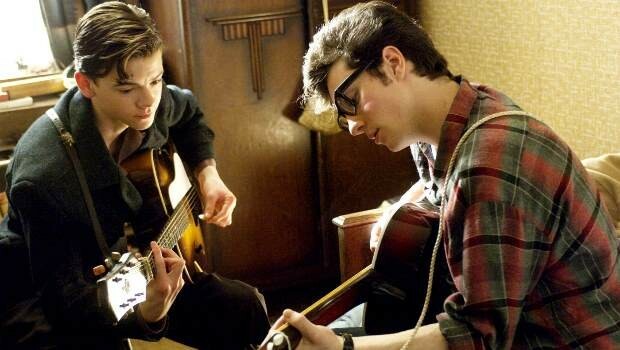 Anyone expecting video artist Sam Taylor-wood’s first feature to be experimental or ‘arty’ might be a bit disappointed; Nowhere Boy is very much a conventional, old-fashioned biopic. That’s not to say its not enjoyable, just that it lacks some of the visual flair that you might have expected. She and writer Matt Greenhalgh (Control) have actually hit on interesting subject matter in the peculiar upbringing of John Lennon, which would be an interesting story even it wasn’t Lennon’s – a young man bought up by his aunt, with all this mystery surrounding his past. That this young man also grew up to be John Lennon is just icing on the cake. Indeed, the film barely mentions the Beatles, though it does foreshadow some of the tensions in the group. Aaron Johnson, while all right as Lennon, is pretty much acted off the screen by Anne-Marie Duff and Kristen Scott Thomas. The latter once again proves she is one of the finest actors of her generation; her natural patrician elegance makes Mimi perhaps slightly posher than she should be but also underlines the contrast between her tailored Dior-style suits and Julia’s funkier bobbysoxer getup. The relationship between the two women is unfortunately sidelined slightly by the fact that this is Lennon’s story and while Johnson does sulky well enough he fails to capture John’s spiky wit and intelligence; he spends a bit too much time flouncing out of houses and slamming doors to the accompaniment of some swellingly melodramatic music. That said, this is a very enjoyable and well-made film, and as a nice home grown contrast to the other Christmas releases, you could do much worse.